Department stores are not the only businesses wanting to take advantage of our holiday spending. Grocery stores know how to play the game very well. With a few simple tips you can make the most of your holiday grocery shopping and keep some of that hard earned money in your wallet. Many of these tips are things you may already know, but consider them a little reminder as your life gets more hectic, so you won't forget. 1) Make Room: Start now to make room for some holiday baking and clean out your freezer. Before Thanksgiving over the next couple of weeks, force yourself to cook and eat what you have in your freezer to make room. 2) Plan baking and menu's now: It seems early, but you will save a lot of money if you take time now to map out what special menu's and holiday treats you'll be making. This helps you with both your inventory check, and sale and coupon hunting. 3) Check your pantry inventory: Check for your basics such as flour, sugar, oil, baking powder, baking soda, spices, etc. Make a list of items you are low on. 4) Buy Now: So here's the scoop: Buy as much of your groceries for Thanksgiving and Christmas now. The fact is that grocery prices now through Thanksgiving will be cheaper than after Thanksgiving. Grocery stores are banking on the fact that you will run out and buy your holiday foods in the weeks after Thanksgiving. So even though they are advertising "sales" the prices will be higher than they are now for the most part. Be wise, and every time you shop between now and Thanksgiving pick up a few items off your inventory list. 5) Look Down and Up! The most expensive items on the shelves are normally kept chest high/eye level. The lower prices are usually kept at the bottom shelf or the very top shelf. Train yourself to look to the bottom shelf and then up to the top shelf BEFORE looking eye level for your item! The spices in the picture above (sorry they were taken with my cell phone) show cinnamon eye level for $1.69-$2.69 for small bottles. The very bottom shelf had bottles twice that size for $1.00! 6) Put on blinders at those cute holiday themed Front of the store or Middle Aisle Set ups: These "Land Mines" are filled with convenience Pantry staples they know you are shopping for. They are always the expensive brands. Skip the cute convenient set ups and head straight for the regular shelves when picking up your holiday items! 7) Shop early in the day, shop alone, and eat first! You already know this but remember that you'll get through the store faster early in the day and without your little helpers. Trade babysitting with a friend, and remember to eat before you go, you'll spend less. 8) Log in to your stores website. Many of them have links to download in store coupons onto your customer key tags. When they scan your tags at the check out, any items in your cart (whether you knew it or not) that had an in-store coupon will automatically take the coupon off your price! 9) Watch out for Loss Leaders! 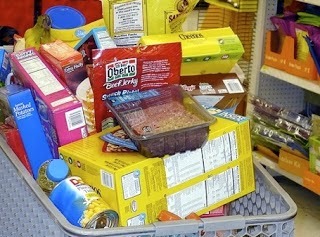 Loss Leaders is a tactic grocery store use to gamble on your spending. They discount certain key items (even below what they pay for it sometimes) to get you into their store. Usually a few key holiday staples. Then they overprice other regular groceries, gambling and hoping that while you are there you'll go ahead and purchase them too! Either do a separate shopping trip for the holiday items or watch your prices carefully during holiday time. Items like: Milk, Eggs, Meats, Canned Soups, etc. 10) Check your receipts! Store are notorious for the computers having the wrong price on items. Take a moment in your car before leaving the parking lot, to review your receipt. It's a hassle, but go back in and have it corrected! Every penny really does count. What tips did I miss? What do you do to save?